Despite our best efforts, many patients will experience a decayed or broken tooth over the course of their lives. When these instances happen, patients can trust in Dr. Jamie Guthrie to repair the damage with high-quality, personalized restorative work that brings back your smile’s full strength and aesthetic appearance. Our team is proud to have combined a warm and welcoming office atmosphere with the latest in modern dental technology here in Ardmore, and CEREC is an important part of that approach. This state-of-the-art tool greatly improves the restorative process, creating same-day dental crowns, inlays, and onlays for patients in need. Contact our practice today to schedule your first visit! When a tooth has become structurally compromised (whether because of an injury, severe dental decay, or the presence of a big filling), a dental crown can be placed over it in order to restore its natural strength and strength. Alternatively, inlays and onlays are very similar to fillings, but they’re made of more solid materials like crowns. They fit either within or around the cusps (the raised ridges) of the tooth. CEREC speeds up the design, milling process, and placement of custom restorations to a significant degree – in fact, a new crown, inlay, or onlay can be completed in a single appointment, which is ideal for patients who consider convenience and speed a must. 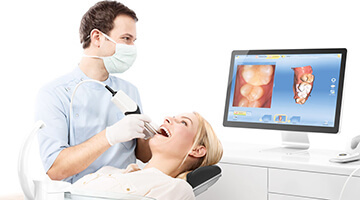 Patients can also say goodbye to the uncomfortable traditional impression materials that are likely to leave you gagging; our team handles this process digitally with CEREC. Dr. Guthrie typically relies on CEREC to create the highest quality temporary restorations possible, ensuring that patients will be fully comfortable and able to enjoy a functioning tooth while we wait for a trusted dental laboratory to create the finished product. In some cases, depending on the patient’s personal needs and priorities, she may recommend the use of a CEREC-created restoration as the permanent replacement. No two cases are the same, and we strive to always do right by patients from Madill, OK and surrounding areas and recommend the treatment option that best suits them.